Today we will start with 大阪弁 ( = Osaka-ben) Osaka dialect! Personally I love the sound of Osaka-ben. It sounds fun and friendly! It sounds very familiar because we hear it all the time on the お笑い番組 ( = Owarai terebi bangumi) TV comedy shows. The dialogue in the picture is a typical phrase in a business scene in Osaka. Everybody in Japan knows it even if they are not from Osaka so as まいど（毎度)! ( = maido). (It literally means “every time” but it means “Hi!“) We sometimes joke around using the phrases. = Maido! Doudekka? Moukari makka? = Konnichiwa! (or Doumo!) Choushi wa doudesuka? Shoubai no hou wa umaku itte imasuka? It is originally from a common greeting of 浪花の商人 ( = Naniwa no akindo) Osaka area’s merchants Osaka people has a reputation of being business-oriented and tight with money like bargaining here and there. I wrote in my previous lesson of 労る ( = itawaru) that Japanese people tend avoid to be too direct. So I think it is interesting that they use this straight forward question naturally. = Maa nantoka yatte imasu. = I will study little by little. = Not at all! Not doing good..
OK! Enough for Osaka dialects. Today’s lesson is about MONEY!! We usually say お金 ( = okane) for money. If you say 金 ( = kane), it sounds blunt and not sophisticated. 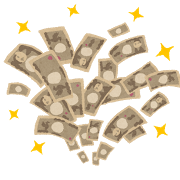 2) お金が欲しい ( = Okane ga hoshii) I want money. = Kodomo no kyouiku ni okane ga kakaru. = A child’s education costs a lot of money. = Ano ie ni wa ariamaru hodo okanega aru. = That family is loaded. = Kare no ie wa kanemochi/yutaka/yuufuku dakara nan demo kaeru. = His family is rich so that he can afford anything. = Uchi no kodomo wa okane wo motaseru to suguni tsukatte shimau. = As soon as I give my kid money, he spends it right away. = Kongetsu wa mattaku okane ga nai desu. = Kongetsu wa mattaku okane ga arimasen. = I don’t have money at all this month. = Chotto okane ga tarinai kara kashite kureru? = I am a little short (on money). Can you lend me some? = Kare wa chotto okane ni komatte iru yousu datta. = He seemed to be pinched for money. = This month is tight. *銭 ( = zeni) also means money but it is old fashioned. But we use it with other kanjis. Ex. 無銭飲食 ( = musen inshoku) eat at a restaurant and leave without paying. = Kanojo wa burando youhin wo kau noni yumizu no you ni okane wo tsukau. = She splurges money for brand-name items. = kozeni ni kuzushite kudasai. = Could you break this? = Kabu de moukete taikin wo te ni suru. = To make lots of money in the stock market. = Sono seijika wa shikin atsume de kurou shiteiru. = The politician has been suffering from fundraising. = Ano hito wa soutou (or shikotama) okane wo tamete iru toiu uwasa da. =They say he has hoarded up money. = Maggie wa kotsukotsu chokin wo shiteiru. = Maggie is scrimping and saving. = chokin ga soko wo tuku. 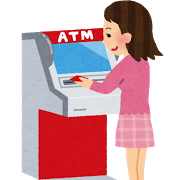 Check other saving expressions in 節約 ( = setsuyaku)+もったいない ( = mottainai) lesson! It is considered to be rude to hand out gift money without putting it in the envelope in Japan. 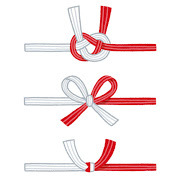 That is called 裸銭 ( = hadaka sen). 裸 ( = hadaka) means naked, bare or raw. So 裸銭 ( = hadaka sen) means “bare money” which is not in an envelope. = I am sorry that I didn’t put this money in the envelope. =Sorry that I am exposing this money. 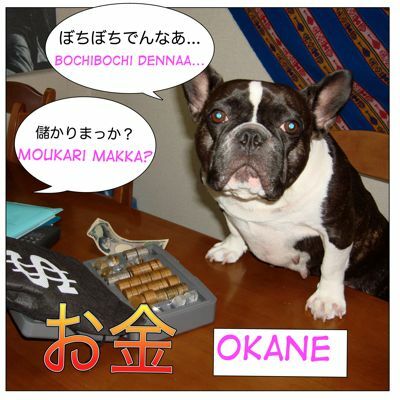 →ポチ袋 ( = pochi bukuro) Check our New Year’s Lesson! 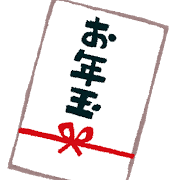 → You can use a simple white envelope and write down お見舞い ( = omimai) on it. You have to write these↓ down on the envelope with your name. Ex. 結婚祝い ( = kekkon iwai) money as a wedding gift、新築祝い ( = shinchiku iwai) housewarming gift,　御出産祝い ( = shussan iwai) baby gifts etc. 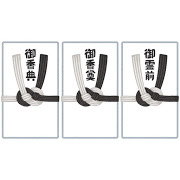 →香典袋（ = kouden bukuro) with black and white string ornaments. You can buy these special envelopes at a stationery store or even at a convenience store. It is considered to be very rude to open up gift money in front of the person who has just given it to you. As I mentioned before it is also impolite to unwrap a gift that someone brings you as soon as you receive it in a formal situation. So if you receive it, just say thank you with appreciation and put it aside carefully. = Nihon no ginkou wa rishi ga tottemo hikuino. = The bank interest rates are very low in Japan. = Dare ka watashi no taisetu hyakuen wo yonhyaku paasento no riritsu de ichinen azukatte kurenai ? =Anybody wants to keep my precious 100 yen(=$1.00) for a year at 400% interest? How do I say “Money can buy anything, even happiness” in Japanese? Is there any idiom that reflects this kind of sentiment/nuance in Japanese? It is not an idiom but the the common phrase we have has an opposite idea. 愛でお金は買えない。= You can’t buy love with money. Maggie, thanks a lot for your lessons. I have a question. Are 利子, 利息 and 金利 synonyms? what all countries have you visited? I love travelling!!! I have been to Holland, Germany, UK, France, Spain, Portugal, Austria, Switzerland, Italy, the US, Purto Rico, Australia, Hong Kong. There are so many countries I have never visited in the world…but I tend to go to the same place again and again. Haha, I knew you would say that! You would like to go to a country where 亀 lives! My favorite place is Hawaii no matter what! so 小銭 includes 5 yen 20 yen 50 yen coins?? 小銭 includes 5 yen 20 yen 50 yen or even 100 yen coins. Yes! I agree! It’s めんどくさい！We have a saying, 一円を笑うものは一円に泣く,too. Actually I am very good at getting rid of all the coins when I go traveling abroad, though… It is like a game for me.